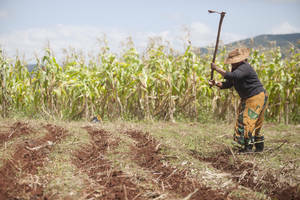 Simisu Sakola works in her cornfield in Swaziland. Southern Africa has had a strong maize harvest in 2014. 11 December 2014, Rome - Latest indications confirm that world cereal production will reach an all-time record of more than 2.5 billion tonnes in 2014.